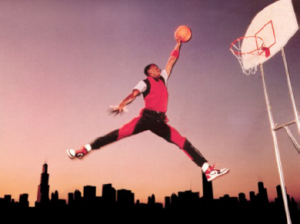 In only three years the “Jumpman” case has become an established teaching tool in CopyrightX. I’ve taught it in the first class for three years running, and I know many other teaching fellows have as well. It’s a great way to get people who are new to copyright law thinking about copyright issues, in this case whether a photograph by Nike infringes a photo of Michael Jordan taken by Jacobus Rentmeester in 1984. The two photos are show below: Rentmeester’s original on the left, Nike’s allegedly infringing photo on the right. 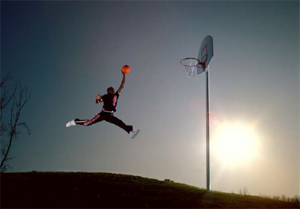 Rentmeester also alleged that Nike’s Jumpman logo (above) infringed the copyright in his photo. Until now, we’ve only had the 2015 District of Oregon decision available to teach this case. In that decision Oregon District Court Judge Michael Mosman granted Nike’s motion to dismiss, holding as a matter of law that the two images were not substantially similar. Now, the Ninth Circuit has upheld this ruling. Rentmeester v. Nike (9th Cir. February 27, 2018). In a lengthy and detailed opinion the court outlined the steps necessary to establish copyright infringement of a photograph, and held that neither Nike’s photo, nor the Jumpman logo (above), infringed Rentmeester’s 1984 photo of Michael Jordan. If anything, this case will now be even more fun to teach to people new to copyright law. Previous post: Is In-Line Linking Illegal Now?